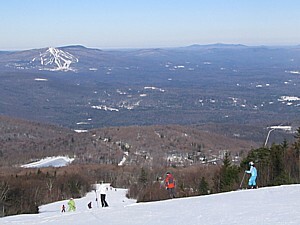 Stratton Mountain Resort is offering special deals over Super Bowl weekend © 2012 Karen Rubin/news-photos-features.com. Super Duper Super Bowl Deals – Giants and Patriots fans alike – heck, Ravens and 49ers fans, too – are in for a linebacker’s weight in savings this Super Bowl weekend. Just because it’s the biggest game of the year doesn’t mean you ought to sacrifice a day of skiing and riding. Grizzly’s and Bentley’s will be hosting Super Bowl parties on their oversized screens and offering all the game day trimmings. The Super Bowl 2-Day Ticket: Buy one day and get the second day at half price! Lift ticket for all ages and is valid Saturday and Sunday (2/4-2/5) for just $130.50. Book online here. The Super Bowl Sunday Four Pack: Get four all day, any age tickets plus one cheese pizza from Double Diamond on Sunday, 2/5, for $199. Book online here. Stratton Links – A few links to bookmark for the very latest in Stratton information. For more information on these or any other Stratton stories visit www.Stratton.com or call 1-800-STRATTON.